A pregnant woman, Mrs Elizabeth Orefuwa, the Lagos State University (LASU) best graduating students in 2015/2016, says she wrote the Unified Tertiary Matriculation Examination (UTME) seven times before gaining admission. The News Agency of Nigeria (NAN) reports that the heavily pregnant student, graduated with a Cumulative Grade Point Average of 4.74 in Accounting Education. 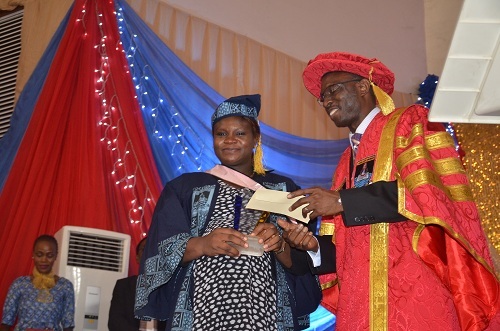 Orefuwa, 29, said during the institution’s 21st convocation on Wednesday in Lagos that the journey through the institution did not come easy but with determination and motivation, she had success a story to tell. She said that in the process of seeking for university admission, she started a professional career in accounting. “During this period of waiting, I started professional career at the Institute of Chartered Accountant of Nigeria (ICAN) in 2007 and became qualified as an Associate Chartered Accountant (ACA) in 2010,’’Orefuwa told NAN. She said that she wanted to study accounting but fate brought her to education, adding that she enjoyed every bit of it and never dreamt of coming out with a first class and becoming the best student. According to her, self-determination and motivation through her father’s insisting on academic excellence give her an edge. “My aim is to get my first degree certificate after several years of waiting and to satisfy my dad, who has been insisting on academic certificate before professional certificate.